My favorite snack is hummus and pita chips. Ok, I'm lying. It's actually Flamin' Hot Cheetos but I recognize that doesn't inspire confidence in my foodie'ness. Plus, you never get the "ooohhh" reaction if you come to a potluck toting a couple of bags of Cheetos. 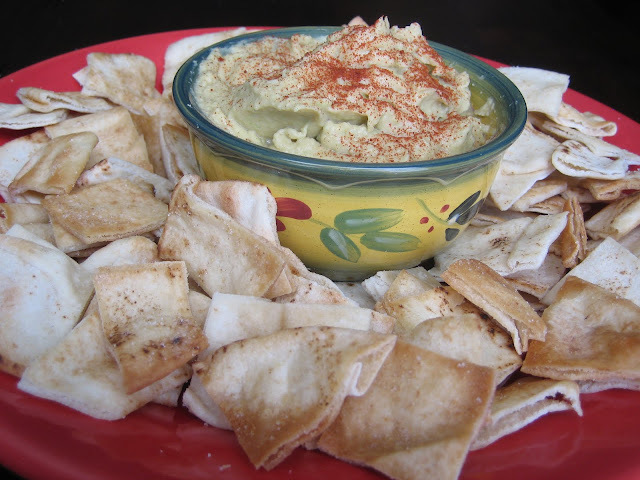 If you want a snack that is not going to burn a hole in your stomach lining, you can't go wrong with homemade hummus and pita chips. 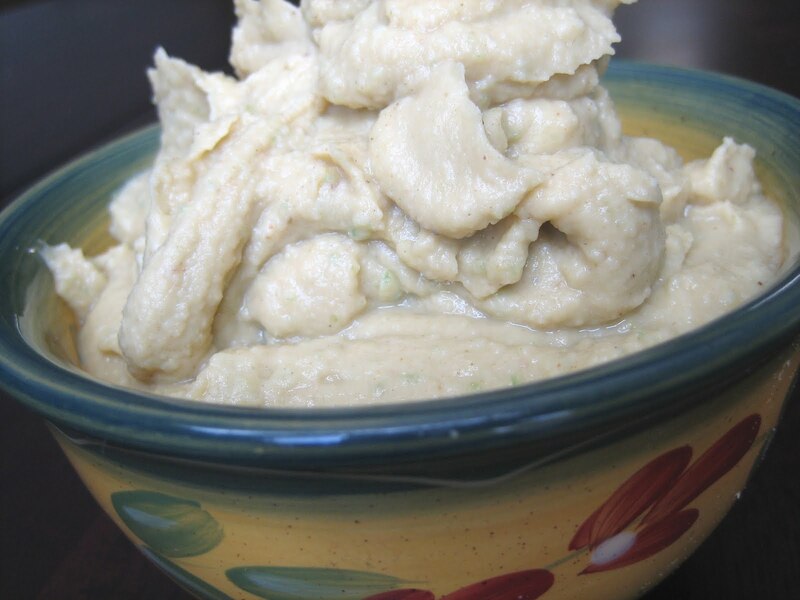 Google hummus and the number of recipes rivals the number of plastic surgeries Heidi Montag has had. I am almost certain most of us would take hummus over Heidi any day. For those of you that would take Heidi, well, you're clearly on the wrong blog. The following is a great base recipe that is open to a number of variations (recipe at the end of the post). Want roasted red pepper hummus? Add some roasted red peppers to the party in your food processor. You want a sundried tomato version? Again, throw some sundried tomatoes in toward the end. Cilantro and lime for your Cinco De Mayo fiesta? Don't mind if I do. Keep in mind you can always add more flavors but you can't take any out so start out with maybe half of the measurements below (except for the garbanzo beans), pulverize, taste, and add the remainder as needed. Confession time. Sometimes, I don't have tahini on hand. Blasphemous, I know. A quick substitution search told me I could use natural peanut butter. Not quite. Truth is, natural peanut butter is a little too sweet but it adds a suitable nutty dimension in a pinch (you'll need to turn up the spices to balance the sweetness). Also, sometimes I don't have garbanzo beans. Doubly blasphemous, I know. A can of cannellini beans (or pretty much any white bean) works just as well. In fact, it even boosts your foodie street cred to subtly mention, "Most people make their hummus with garbanzo beans but I prefer the texture of [insert white bean here]" at aforementioned potluck. If all else fails, you really can't go wrong with bringing Cheetos to a potluck. Dump 'em in a pretty bowl and top with a cilantro chiffonade. Drain and rinse garbanzo beans (reserving liquid). Add garbanzo beans and remaining ingredients (except salt and pepper) to food processor in no particular order. Pulverize. Add reserved garbanzo bean liquid one tablespoon at a time if mixture is too dry. Yes, I realize this defeats the purpose of rinsing the garbanzo beans but it's my recipe and I'll rinse if I want to. Cue "It's My Party." Season with salt and pepper. Dump in a bowl. Drizzle with olive oil or sprinkle with paprika if you're feeling festive. Resist the urge to eat hummus with a spoon while pita chips bake. Longest ten minutes ever. 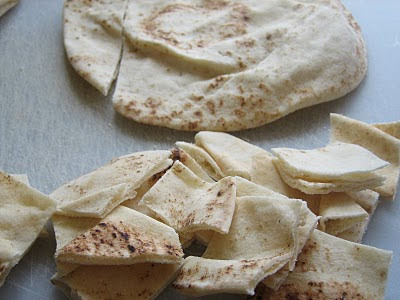 Cut pita into squares to wedges. Add dry spices to oil. Brush onto pita pieces. Bake at 350 degrees for ten minutes. "Resist the urge to eat hummus with a spoon." Man, you're classy. I just go for the finger dip. I am really enjoying your blog! Thank you so much for this hummus recipe. I'm tired of shelling out 4 dollars for a measly 8 oz container of hummus. This will be much used! Monet- For $4, you could fill a bathtub with hummus. Come to think of it, that'd be a pretty cool blog post :) Thanks for stopping by! Flaming Hot Cheetos!!! Reminds me of the high school. But hummus is good too. And it doesn't stain your fingers red like the cheetos do. Love your food blog! Flora- Thanks! I forgot about high school Cheetos. I can't believe I've loved them for so many years. Probably because they are awesome! I'm a freaking geeenius - I remembered to come look for your recipe!! I have such a craving now, especially since I know this is some seriously good stuff. Thanks, lady! ps, jalapeño, really? I never would've guessed. i LOVE hummus but tend to get lazy and just buy it at the store. i'll have to try your recipe next time!